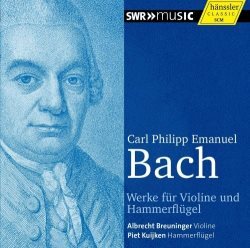 Carl Philipp Emanuel Bach was born in 1714. This means that 2014 is a commemoration year. It is to be expected that a number of recordings of his music will be released. In 1988, when his death was commemorated, he was still a largely unknown quantity, and the many recordings which were produced at the time have greatly improved his reputation. Today his music is far more often performed and he is well represented in the catalogue. The Swedish label BIS realized two of the most important recording projects around Carl Philipp Emanuel Bach: the complete recordings of his keyboard concertos and of his oeuvre for keyboard solo. The chamber music is a lesser-known part of his outuput. The best-known pieces are the three quartets for keyboard, flute, viola and bass and some of the flute sonatas. The works for keyboard and violin are not that often performed. However, the later works in this genre are substantial pieces which reflect some of the features of Bach's style. The first attempts in this department date from the 1730s when Emanuel was still a pupil of his father. Some of his chamber music compositions from this period are attributed to the latter. This indicates that stylistically he didn't move far away from Johann Sebastian's style. The situation was very different some decades later when Emanuel worked at the court of Frederick the Great. His compositions were such that his employer didn't enjoy them very much, as he was especially fond of the galant idiom of which his flute teacher, Johann Joachim Quantz, was an exponent. However, it is questionable whether the difference is as large as has often been suggested. Recent explorations of Quantz's music show that one doesn't do him justice if one considers his music as nothing more than galant. It seems that the antagonism between Emanuel and Frederick was largely personal. They just didn't like each other very much. Emanuel was probably also too self-confident for Frederick's liking - clearly a legacy from his father. Most of Bach's chamber music compositions date from these years. They were not written for performance at Fredericks court, but rather at the homes of wealthy citizens in Berlin. Here Bach moved in circles of the bourgeoisie and representatives of the Enlightenment: artists, musicians and poets. He became acquainted with some of the most renowned writers of his time, many of whose poems he set to music. A large part of his songs for voice and keyboard date also from this time. The sonatas show an increase in emotion and drama. This was probably partly inspired by the Italian operas he heard at the Berlin opera which was founded in 1741. The three sonatas recorded here date from 1763 while the Arioso in A was written in 1781 when Bach was director musices in Hamburg. The latter is a piece for keyboard with violin accompaniment. The violin adds some colour to the keyboard part, but otherwise has no substantial contribution. The situation differs in the three sonatas, although here the keyboard has the lead as well. However, in various movements the two instruments play thematic material of their own. One sometimes get the impression of the two instruments playing apart. We also find features that we encounter in his keyboard works and some of the symphonies: sudden changes in tempo and dynamics and unexpected pauses. Considering that the works for keyboard and violin are not that well-known this disc should be most welcome. However, there are several things amiss. To begin with, the title is misleading: these are not works for violin and fortepiano - it is the other way around. Moreover, it is highly questionable whether Bach had the fortepiano in mind while composing the three sonatas. At that time this instrument had not fully established itself as an alternative to the harpsichord. It seems very likely that the latter still had the dominance. These two aspects have a damaging effect on the overall result. The violin is often too assertive here. This is not only due to the approach of the artists, it is also the result of Albrecht Breuninger playing a modern - or probably 'modernized' - violin. The instrument is not specified, but as far as I am aware Breuninger has no credentials at all in the realm of period instrument performances. Also the sound of the violin clearly suggests that this is no period instrument. In order not to dominate too much Breuninger has to reduce the volume of his playing. This has the same effect as a pianist trying to make his instrument sound like a harpsichord: it detracts from some of the features of the instrument. The expressive qualities of the violin are not explored. Dynamically Breuninger's playing is too flat. When he plays forte, once in a while, the violin overshadows the fortepiano. As a whole these performances are not very expressive. Sometimes I found them dull, especially in the Sonata in c minor. The identity of the fortepiano is also not revealed. I have the impression that this is an instrument - or the copy of such an instrument - from the latest decades of the 18th century. That could be acceptable in the Arioso in A but not in the sonatas. If a fortepiano is to be used here, it should be an earlier instrument, for instance a Silbermann. I have to add that Piet Kuijken's playing is not that energetic and he doesn't fully explore the expressive qualities of the keyboard parts. All in all, this is rather disappointing. It is very much to be hoped that this part of Emanuel's oeuvre will be recorded with more appropriate instruments and in more engaging performances.